I used to be afraid of fish. No, I don’t mean fish phobia. I mean I was afraid to cook it. I’m not sure what fostered this fear, but many home cooks have it. 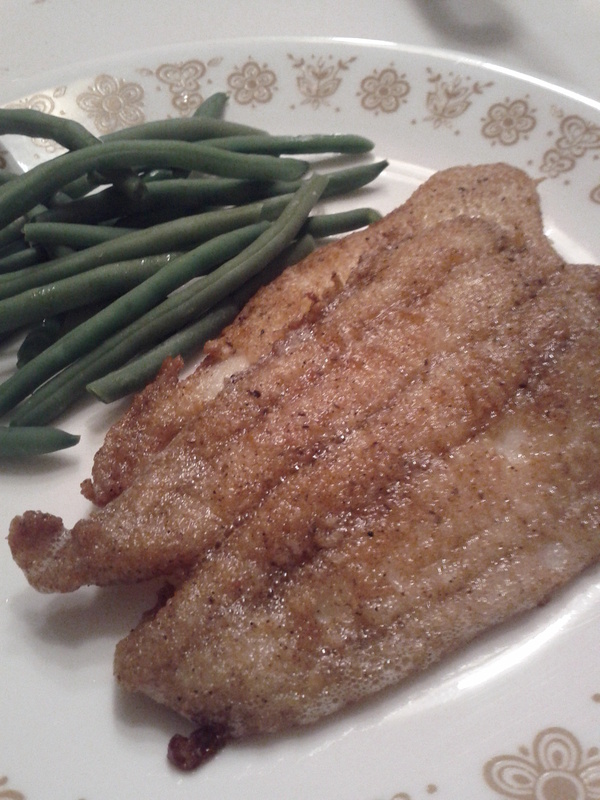 The best I could manage for a long time was pre-breaded fish sticks. Luckily, fantastic fish is only minutes away and you can end up with perfectly cooked and delicious fish each time, as I discovered a no-fail fish cooking technique that has become my stand by. It works on most any fish filet from catfish to red snapper to salmon. We had this last night with some Dover sole and Test Subject Bill pronounced it the best fish in some time. In fact, he told me that I should always make fish this way from now on. I’m not going to take that as a negative reflection on my previous fish dishes. I don’t quite remember the provenance of this technique/recipe, but I’m pretty sure Alton Brown had something to do with it. I like to use the remaining butter in the pan as a brown butter sauce over the fish or on whatever vegetable I’m serving with it. YUMMY. If you’re making a full pound increase the volume of ingredients by about 50%. (That’s 9 T flour, 1.5 T seasoning and 6 T butter for those math challenged.) How much you have leftover will vary based on how much surface area your fish has, but ALWAYS TOSS THE LEFTOVER FLOUR. Right? Right. Feel free to tinker with this. Use curry powder or lemon pepper instead of Old Bay (or taco seasoning and use them for fish tacos). If you’re gluten free or paleo try coconut flour, arrowroot powder or almond flour instead of AP flour. In other words, go wild! * If you buy through my links it costs the same and I get a small commission. Thanks for your support! One of my favorite cookbooks is not a cookbook at all, but more of a handy manual guiding you on how to become your own hero in the kitchen. Ok, maybe not. Or why not…all depends on your definition of a hero. This book, however, is no Google. And I mean that in a good way. Google might be good for recipes worth putting your own personal spin on, but it’s not always so good for really teaching you what goes with what or how to build depth in a dish. Not all flavor combos are as intuitive as tomato and basil or ham and Swiss. When you’re ready to take your recipe tinkering to a new level, open your kitchen to The Flavor Bible. The Flavor Bible opens with a discussion about taste, mouth feel, aroma and the “X” factor. It covers weather, seasonality, occasion, weight and more. While this is fun, it’s thankfully a small portion of the book because I’m just not all that crazy about introductory parts of books. I want to get into the meat of things so to speak. But as far as intros go this one is actually pretty good, and about the right length. The book also lists out Flavor Affinities – groups of ingredients that sing together beautifully (my description, not theirs). For example, it offers avocado + lemon + smoked trout. Or fennel +almond + fennel seeds + honey + lemon. When you’re stumped, you’re never at a loss for long with all the options this book provides. It’s a great way to learn your way around flavor combinations and make a good dish great. It is totally worth the price to pick up this gem for yourself or the cook in your life. Christmas is just around the corner! *If you buy through my links it costs no different and I get a small commission. Thanks for your support! Last week I promised a recipe for my taquito freezer meal. These tasty bites can be made for now or frozen for later. They can be an appetizer, a side dish or a meal all on their own. I pan fry these instead of deep fry, but you could certainly deep fry them if you prefer. We like them with sour cream or guacamole dip. Yum! This recipe is also very versatile and it makes a LOT of taquitos. Be prepared to feed a crowd or freeze the leftovers. 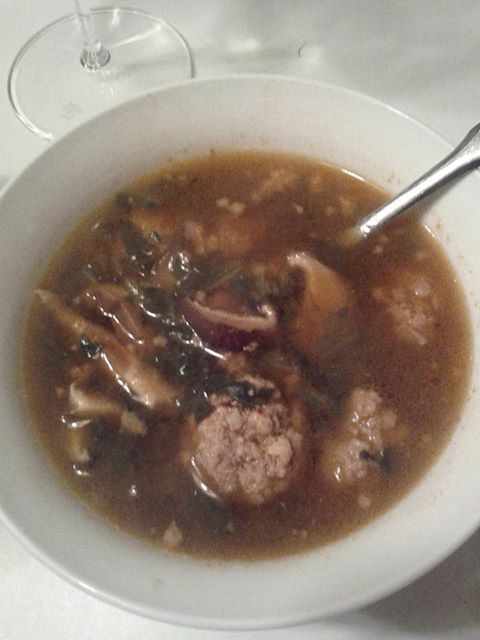 Combine all the stuffing mix ingredients together in a very large bowl. Start with a teaspoon or so of each of the seasonings, taste and adjust to your personal preference. Heat corn tortillas until soft and pliable. Roll up with stuffing and secure with a toothpick, taking care not to over stuff. Pan fry in coconut oil until lightly browned. Depending on the size of your chicken and how full you fill the tortillas, expect to end up with 60 to 80 taquitos. To freeze: Pan fry just enough that everything is holding together. Allow to cool on a wire rack, then line them up on a sheet pan with a half inch or so between each taquito. Freeze for at least one hour before transferring to freezer bags for storage. *Option: I found that using spring roll wrappers instead of corn tortillas resulted in taquitos MUCH easier to make that held together better and it was not detrimental to the taste. I will be using spring rolls from now on. Plus this opens up a whole world of Asian fusion possibilities…but that’s another post! I’ve made use of freezer meals for a long time. Busy work weeks or deadline season, working and going to school and most recently, having a baby, have all been reasons for me to stock the freezer with instant chow. Thaw, heat and enjoy! By far the most freezer meal prep I’ve done was in May of this year, knowing that our Wee William was just weeks from making his grand entrance. It turned out he decided to do so 15 days early, so I was glad I’d decided to get my freezing done well in advance! By the time I was done I had a buffet of items in both the deep freeze and fridge freezer to choose from. I thought I’d share the recipes that worked the best for me. Here they are, along with any suggested tweaks! Spring Rolls. You can even freeze and reheat the dipping sauce. Tortilla Soup. Leave out the toppings and freeze. When you reheat, break out the toasted tortilla strips (you can make a bunch and store in an airtight container for a few weeks) avocado, cheese and lime. Stuffed Shells. Use the recipe right off the box. Or do like I did and cook up a pound of sausage and stir that into the stuffing. Beef & Broccoli. Undercook the broccoli a bit. Serve over rice. Not a stellar freeze texture wise on the sauce, but all the flavors hold up. Lasagne. Recipe is great as is. Freezes like a champ! For the record, I did NOT use Kraft “parmesan” cheese. I don’t know what that crap is. I bought a huge chunk for a discount at Whole Foods (how often does that happen?) and grated a boatload of it one afternoon. You can freeze it that way for months. I just bagged it up in about one cup portions and pull out a bag as needed. KKF Jambalaya. A KKF version of old fashioned Jambalaya. See below! There are lots of great freezer meal recipes out there – feel free to share your favorites in the comments! Sauté onion, garlic, peppers and celery in oil til soft. Add 1 jar tomato paste, tomato sauce, chopped tomatoes and seasonings. Cook the heck out of it. Add meats and shrimp. Add second jar of paste and chicken stock until you get the desired consistency. Heat through. Serve over rice. I’ve been on a long hiatus, but like the salmon, I always come back. The past year has been an amazing. I went from one person to two and back to one. I had all of my priorities reorganized and got a crash course in babies. My son is now 4 1/2 months old. I keep staring at him, still a bit in unbelief that he’s actually here. He grins back at me, and I feel like maybe I am getting the hang of this mom thing, at least for this moment. As he’s gotten older and slightly more independent, I’m able to turn for a few moments a day back to my old pursuits. Kitchen Kung Fu is going to be getting a make over and a new direction soon, but rest assured I will still be bringing you my usual KKF recipes, recipe hacks, recipe spin offs and an extra 20% snark at no additional charge. It’s salmon season! The time of year when the fishermen (and women) are back from the waters and ready to sell their salmon to their excited customers. I purchased some sockeye salmon and smoked pink salmon this year from Lummi Island Wild Salmon. This is the second time I’ve purchased from them and will be getting some halibut from them some time soon which I’m totally jazzed about. Put saffron threads into a coffee mug and cover with about a quarter cup of very hot water. Set aside to steep. Boil your water for the pasta and add a tablespoon or so of oil. This will keep the pasta from sticking together. Cook according to package directions, about 11 minutes for al dente. Melt the three tablespoons of butter in a cast iron skillet over medium heat. When hot, put salmon filet skin side up and fry for about three minutes, then flip and fry for another three minutes or so. We want it to still be nice and bright pink in the center. Set aside and cover with foil for five minutes, then shred up the salmon into small chunks. Use your hands. Sample a bit of salmon while you’re at it. While the salmon is frying, slice up your pepper. As soon as the salmon comes out of the pan, toss the red peppers in and give them a good sear in the leftover butter. Cook your peas according to package directions and strain well. Melt the 1/4 cup of butter in a small sauce pan. Add the flour tablespoon by tablespoon and whisk vigorously. Let it get nice and bubbly to cook the flour but keep it moving so it doesn’t burn. Pour in the saffron and water, continuing to whisk, then slowly add the milk, whisking each bit in completely before adding more. (More milk for a thinner sauce, less milk for a thicker sauce according to your preference.) Whisk in the coriander and salt and pepper to taste. 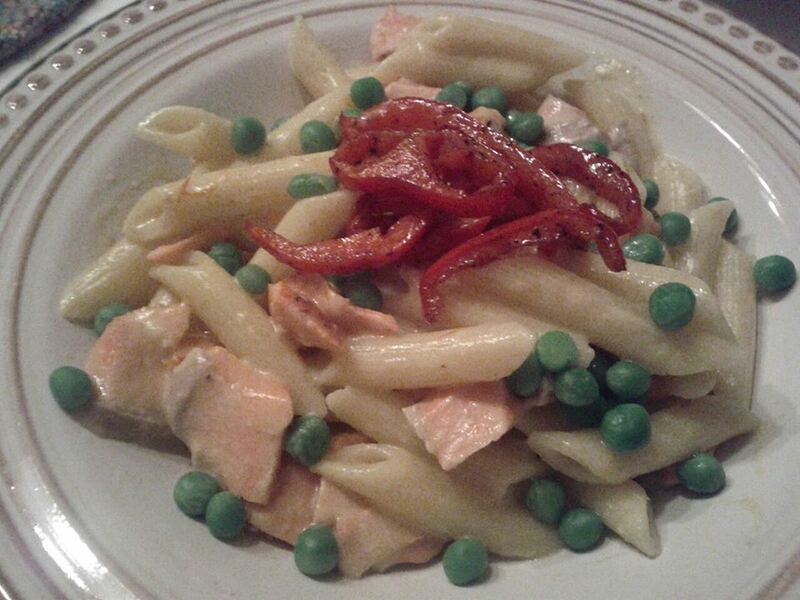 When the sauce is thickened to your liking, combine the sauce, penne, salmon chunks and strained peas. Top with the red bell peppers. I recommend a buttery chardonnay to go with this. Here’s a wine that lives up to it’s name…Butter Chardonnay from Jam Cellars. Enjoy! Low carbing? Good for you! Not impressed with the chemical crap storm nutritional composition of Atkins bars but still want a treat? Even better! You don’t have to subject yourself to those things to get a sweet fix of dessert! Try this next time – but do plan ahead. It’s best when it’s been in the freezer a few hours. Whisk the egg yolks until smooth, then add the cream, whisk well. Add the other ingredients slowly and whisk well until it is well combined. Whisk in the vodka. (This adds flavor but mostly keeps it soft enough to scoop when you pull it out of the freezer.) 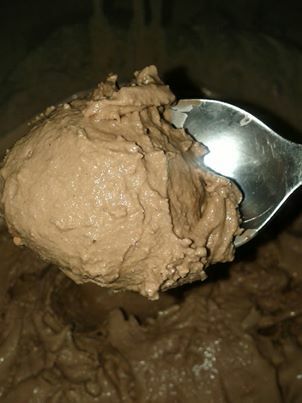 Put it in your ice cream maker (I have this one) and churn til nice and thick – I left mine for about 20 minutes. FREAKING YUM. And the entire recipe has about 20 carbs. Not that I suggest you sit down and eat the whole thing in a sitting…. * I make this with the empty pods when I use the beans for something else. Once I’ve scraped the pods and used them for whatever else I was making, I stick the empty pods in a pint of vodka, stick it under the bar and forget about it. Works great and I made my vanilla beans pull double duty!